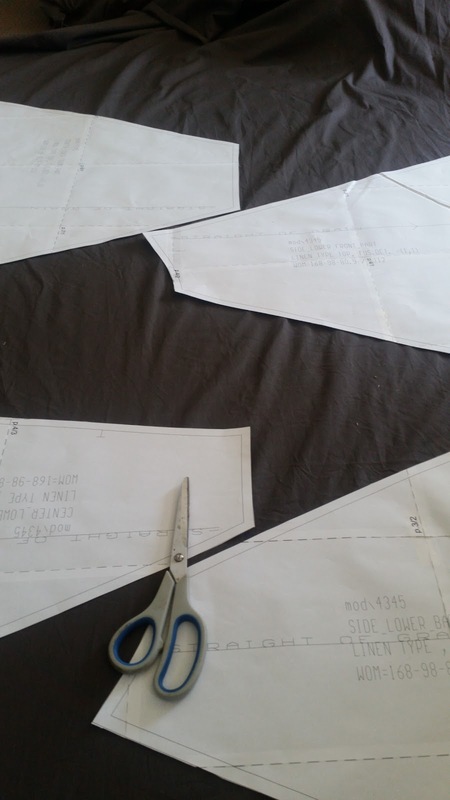 I always struggle when making a new dress or outfit or even a quilt, when I make that first cut into the fabric. You spend so long dreaming and planning what this fabric is going to become but once you make that first cut you can't undo it! ''What happens if I cut in the wrong place"
"What happens if it doesn't fit or I've planned the wrong size"
"Do I definitely have enough fabric to fit the pieces onto?" "Are the pieces the right way around?" "After all this work will I actually like and wear the finished piece?" This is the current floor of my craft room. I have the fabric laid out on the floor with the pieces of the skirt sitting on top. Since taking this photo I've already rearranged the pieces once. What makes it hard is 3 of the skirt piece will need to be cut a second time so I can't lay them out twice to see what will fit better. Then there are the bodice pieces for this dress and the waist yoke. I am extremely glad I have 4 meters of fabric to play with particularly since it's a broadcloth so not as wide as fabric normally is. The other thing I have to remember is to add another cm into the back seam so I can add the zip easily otherwise I'll be sitting there with not enough fabric. I'm making a Lekala 4345 dress. (warning if you like collecting clothes patterns that is a BAD website!) Well I should be saying I will be making.... it is still currently spread out on the floor waiting for me to be brave. 4 days later..... tonight I will get up the braves.... tonight. It's so easy to undo your cross stitch or knitting and crochet. Although it does make rather a mess of threads and yarn when you do so it is very easy to do. It's not easy to undo a bad cut in fabric. But... this dress will be completed before I have to start back at uni next semester! I want to be able to wear it to work. I want to be able to enjoy it so by this weekend it will be cut out and I can get started with sewing it all together. It shouldn't take long once I start. It's a simple design. What do you find the hardest when starting a new project? Do you struggle to cut the fabric? I agree with you....that first cut is the hardest! Good luck with your skirt. Thank you :D and it is almost all sewn up now! Not long until I will share my new dress with everyone. I don't do dressmaking but I am sure I would cut my margins too narrow as that is what I do with my cross stitch fabric, one inch margins are not enough for framing! No and I remember cutting out my last piece of cross stitch fabric and counting again and again just to be sure I cut enough with a large enough border! Once that cut is made it is easier.